Semiconductor Engineering - When Will 2.5D Cut Costs? Semiconductor Engineering - When Will 2.5D Cut Costs? Home > Low Power-High Performance > When Will 2.5D Cut Costs? When Will 2.5D Cut Costs? Stacked die appear inevitable, but at there is a lot of discussion about when they will offer economic benefits and what will drive a new cost equation. There is a constant drive to reduce costs within the semiconductor industry and, up until now, Moore’s Law provided an easy path to enable this. By adopting each smaller node, transistors were cheaper, but that is no longer the case, as explained in a recent article. The industry will need to find new technologies to make this happen and some people are looking towards 2.5D integration as one of the most likely to fulfill that role. However some technological and economic hurdles have yet to be overcome. Today, many companies integrate several dies together using package on package (PoP) technologies. These include flip-chip, where one chip is turned over and mounted on top of another, a technique that has proven quite popular for processor and memory combinations. How far can this more restrictive technology go before adding an interposer? The benefits could be huge. “Package on package (PoP), 2.5D (interposer) and 3D ICs have great promise when it comes to lowering costs for a system of heterogeneous components that need a high level of connectivity, integration and low power,” says Kevin Kranen, director of strategic alliances for Synopsys. Sensors, analog and optical are likely to be kept on earlier processes such as 40nm planar for a long time, and yet the benefits of close integration can still be had through a 2.5D integration. But the costs are still too high for most people to make the leap. “Today, the performance ratio is not quite there, but there is a lot of activity,” says Soheili. Dies that are known to work standalone may not work together. This means new risks to yield and cost. Die integration cost is high today and needs to be brought down. The economics of a multi-die integration will always compete against single die solutions. Process issues related to 2.5 and 3D have to be worked out. There is the small matter of making 2.5D work and to make it work economically. There are few universally accepted die integration standards. Standards should lower cost and decrease risk. We will examine each of these issues and look at some of the solutions that are in the works today. The TSV technology is also new and there are problems associated with it. The reliability of the TSV interconnects is impacted by thermal induced stress resulting from a co-efficient of thermal expansion mismatch between the interconnect metal and the silicon substrate. EV Group has developed one potential solution, which applies photoresist and other functional polymers at and within TSV geometries to act as a stress buffer between the silicon and copper. 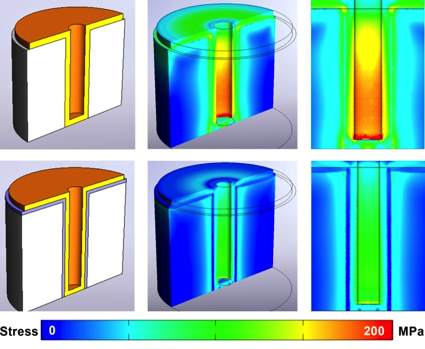 Simulated distribution of thermal induced stress in different TSV designs. The top row shows a TSV with thin annular metal lining (d = 10 µm). The middle row depicts the thermo-mechanical buffering influence of a thin (d = 5 µm) BCB polymer lining between the metal and silicon matrix. In both cases the thermal induced stress is investigated at 100°C for TSVs with a via diameter and via depth of 50 µm and 150 µm, respectively. Courtesy of EV Group. Things can go wrong during assembly, especially if the different parts come from different foundries and this creates a number of issues that have yet to be resolved. Semiconductor Engineering wrote about the turf war going on between the semiconductor manufacturing companies and the outsourced semiconductor assembly and test providers (OSATs) who have dominated IC packaging and testing to date. But it may be easier for semiconductor companies to move onto the OSAT turf than the other way around; although they may want to retain the margins they are used to making rather than the smaller margins of the OSATs. Others see the need for new tools, particularly in the areas of modeling and analysis. A recent book “Design and Modeling for 3D ICs and Interposers” by Madhavan Swaminathan and Ki Jin Han (full review to be provided) sheds light on many of the modeling aspects of TSVs. “Consider the electrical response of TSVs, which are defined by their physical dimensions such as diameter, height, oxide thickness, pitch, shape (cylindrical or tapered) and by the materials used (copper, tungsten, oxide and silicon). These structural and material properties not only affect their electrical response but also affect their mechanical and thermal behavior.” The concepts contained in the book are being commercialized by E-System Design. Standards provide a foundation that can focus the efforts of many people and organizations. But when standards are created too early they can stifle innovation. “Standards need to emerge and be proven in the marketplace,” says Janac. He points to Wide I/O as an example of an emerging SoC standard for DRAM integration. However, it appears that this may not be ready for adoption yet, as reported in Tougher Memory Choices in June. Another standard being developed for 3D testing enables access to devices within the middle of a stack. While not strictly necessary for 2.5D, such a standard would enable disparate test structures to be connected together so as to present a coordinated approach on the external pins of a 2.5D structure. The IEEE 1838 working group is currently developing this standard. E-SD has commercialized and released our 3DPF V3.0 at this year’s ECTC conference in Orlando. After working with many large companies and their valuable feedback on V1 and V2, we felt V3.0 was ready for the masses. Please contact me if you want to have an evaluation copy. Very easy and intuitive to use. Late October (EPEPS conf), we will release an upgrade module for additional functionality that was requested by several companies. A good, balanced article, need more such to clear the hype and fog created by amateur Bloggers eager to make a fast buck with 2.5 – d / 3-d die stacking, a technology that still needs to resolve several fundamental technical concerns before prattling on about design and supply – chain issues. A suggestion for Brian, how about a few more articles on 2.5-d and 3-d stacks, but cover electrical performance, process and reliability issues in some depth. Find and talk to technical people, not more bloggers or marketers.